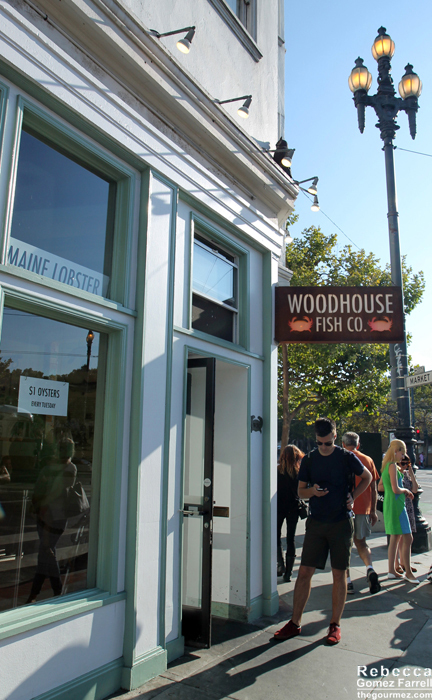 Home / Dining in San Francisco - CA / Woodhouse Fish Co.
On the northeastern border of the Mission and the Castro, after having spent an afternoon tasting wines from Bliss Imports, I came across what looked like an oasis for my crustacean-loving heart. The sunny restaurant gave me the impression it would soon fill up, though I was walking by at only 5 pm. Not only that, but it managed to make nautical design come across as cozy rather than gauche, and I’m still not sure how they pulled that off, especially with plastic fish and crabs among their wall decorations. Perhaps it had to do with the archival photos of fishing villages and the cans of oysters and scallops used to hold silverware. I took a seat at the bar, and the restaurant did indeed fill up in the 40 minutes I spent there. 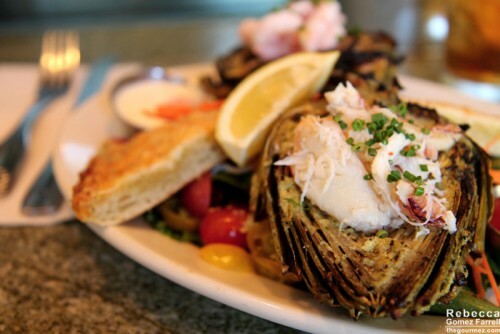 It was a tough choice between the split-top lobster roll and the grilled artichoke stuffed with crab and shrimp. The artichoke won. I was delighted when it came out with an unlisted salad of green and red leaf lettuces, beets, tomato, carrot, and a light French dressing of balsamic vinegar and mustard. That dressing was fantastic, but I was less impressed with the also unexpected garlic bread. It’s French bread topped with butter, pesto, and a thick slice of parmesan cheese that’s been melted. For me, it was too heavy and dense, but that doesn’t mean I didn’t eat every bite. The simple crab and shrimp stuffings prominently featured both ingredients at their best, but the artichoke itself was hit and miss. Although the crunch of the very grilled outer leaves provided a fun, chiplike texture, it was dry overall until I reached the very inner leaves. I appreciated the garlic paste and peppercorns slathered on top of the artichoke, but the accompanying cocktail sauce and plain mayonnaise for dipping were just that—too plain. Like I said, though, it gets better the farther down you eat, and the char has a more beguiling effect as you go as well. 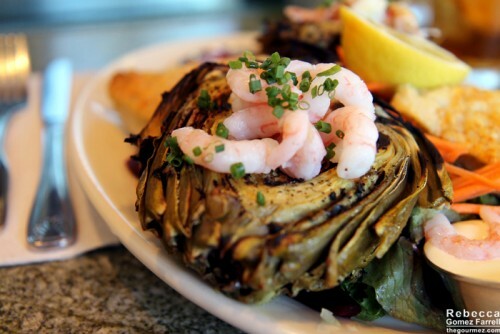 Who isn’t in love with artichoke by the time you’re eating the heart? 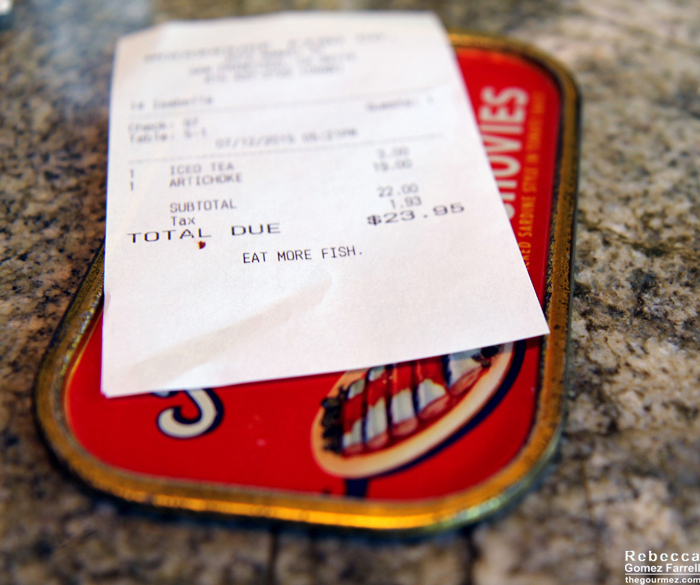 I also appreciated the use of sardine can lids for presenting checks. One thought on : Woodhouse Fish Co.
Mmm… That looks like a delicious and fun find. 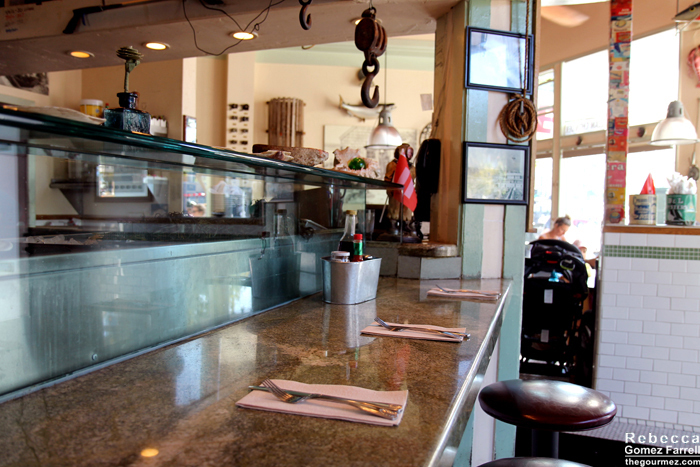 Will have to consider it for our next San Fran trip (which I hope will be sooner rather than later). I’m a huge seafood fan too.